Copyright 2012, 2013 Jeffrey R. Charles All Rights Reserved. Appendix C: Relevant Dimensions for Micro 4/3, Leica, Hasselblad, Etc. In recent years (mostly since about 2008), many have used rangefinder camera lenses on interchangeable lens digital cameras having a sufficiently short lens flange to focal plane distance. Some used rangefinder lenses in this way because they already owned them, but many did so to obtain shallow depth of field that was not possible with the relatively slow f/ratio lenses initially offered by many digital camera manufacturers. Others used rangefinder lenses because of their high resolution and compact size. Still others used such lenses because the cost (particularly for Russian lenses) was considerably less than the cost of equivalent digital camera lenses. At first, Olympus and Panasonic Micro 4/3 cameras were the most popular digital cameras having a shallow enough lens flange to focal plane distance to accept rangefinder lenses, but it wasn't long before other manufacturers got into the act. For most manufacturers, accommodating rangefinder lenses probably was not the primary motivation for offering cameras with shallow lens flange to focal plane distances. Making the camera and associated digital lenses compact was probably the main consideration. Today, cameras compatible with rangefinder lenses (some of the cameras even having a Leica M mount) are (or were) offered by Epson, Fuji, Leica, Olympus, Panasonic, Ricoh, Sony, and others. My own motivation for using rangefinder lenses on my Micro 4/3 camera was a combination of lower cost (before used rangefinder lenses prices went up so much), high resolution, compact size, and fast f/ratios for low light photography and movies with shallow depth of field. At the time, many Micro 4/3 lenses that fell outside the f/ratio or focal length range of the kit lenses were quite expensive. Even today, relatively fast f/ratio Micro 4/3 prime lenses (now that they are available) are somewhat expensive in comparison to medium priced but still excellent rangefinder lenses. In 2011, I had to switch from a digital SLR to a camera having a high resolution EVF. This was partly due to gradually losing the ability to accurately focus an SLR, but a smaller and more portable camera system was also desirable. For best results in compositions requiring some thought, I've always preferred manual focus, so the ability to achieve accurate manual focus was important. I ultimately decided on an Olympus E-P series camera with an EVF attachment that can be tipped up for low and high angle photography. The shallow back focus required by Micro 4/3 cameras made compact rangefinder lenses an obvious choice for manual focus use, since they are compact and will retain a focus setting even when the camera is powered off and on. Even better, some rangefinder lenses have high performance at very fast f/ratios. At the time, there were not many affordable digital cameras other than Micro 4/3 that could accept rangefinder lenses, either directly or via adapters. However, some unpleasant surprises were in store concerning the use of short focal length, fast f/ratio rangefinder lenses on my Micro 4/3 camera. These surprises would not come to light until after I had made a significant investment in the related photo gear. The least pleasant "surprise" was the radial image blur in off-axis parts of the image that later parts of this article will emphasize. At first, I only used two Olympus kit lenses (17mm f/2.8 and 14-42mm f/3.5~5.6) and a few low to moderate cost normal to tele rangefinder lenses (50 and 135mm) on Micro 4/3, and these worked extremely well. I also used a compact 75mm f/3.9 Tamron C-mount megapixel lens for movies with the E-P2, and it also worked well for the type of movies I used it for. For a medium tele lens on Micro 4/3, the 50mm f/3.5 Industar-22 (MgF2 coated version) was very low cost, though it had to be stopped down past f/5.6 for good performance over the full Micro 4/3 format. It was more than worth using because it had better contrast and color saturation than either the Olympus kit zoom lens or the Leica 50mm f/3.5 Elmar lens that its makers may have sought to emulate. For a 90mm, I tried both the 90mm f/2.8 Elmarit and the Contax G Zeiss 90mm f/2.8 Sonnar lens. These were the last tele rangefinder lenses I acquired, purchased even after some of the wide angle lenses. The Contax G 90mm lens produced zippier results than the Elmarit and delivered images as sharp as the 12MP camera sensor could capture at f/5.6, so it became the 90mm lens I use most in spite of the cheesy focusing adapters that must be used for digital photos with Contax G lenses. For this lens, I used the adapter with a little direct drive focusing wheel, but the adapter had to be modified to seal it and keep dust from getting in around the wheel. In fairness to the 90mm Elmarit lens, it is not in as good of shape as the Contax lens, which is pristine. I also had an 85mm f/2 Nikon SLR lens, but did not use it as much because it was significantly larger when a Micro 4/3 adapter was attached. For a 135mm, the Leica 135mm f/4.5 Hektor lens was an obvious choice due to its low cost, which at the time was less than 1/3 as much as a 135mm f/4 Elmar. When stopped down to f/6.8, the Hektor delivered an image almost as sharp as the camera sensor could capture. Since a Hektor had worked well for me when I used one for film photography in the 1970's, it was the first rangefinder lens I acquired for digital. The Hektor is technically a "long" lens rather than a telephoto, since its simple design does not undertake to shorten its physical length. I later tried the 135mm f/4 Elmar. It has better edge resolution versus aperture on a full frame format, but there is little difference in performance from the lower cost Hektor on the smaller Mirco 4/3 format. One really cool thing about the Olympus E-P series cameras is that they can fit in a slightly modified version of the vintage Olympus Pen-F hard shell gadget bag (pictured below), giving the system a retro look and feel. The vintage Pen-F case can be modified to work well with the E-P series camera plus one Olympus digital lens plus some small rangefinder lenses, but not with multiple digital lenses because the compartment on the right side is too narrow for them. So all was well - until I tried to use shorter focal length, faster f/ratio rangefinder lenses on Micro 4/3. When I got my first fast f/ratio wide angle rangefinder lens to use as a medium tele on Micro 4/3, the 35mm f/2 Contax G Zeiss Planar was the clear choice in terms of cost versus performance. By then, the Sony NEX-3 was out, and people were getting excellent results at full aperture with the 35mm f/2 and 45mm f/2 Contax G Zeiss lenses on that camera. However, when I used the 35mm f/2 Contax G Zeiss lens on my Olympus E-P2, its images were fuzzy around the edges and downright bad in the corners unless the lens was stopped down to f/5.6. Olympus E-P2 digital camera and images through a Contax G Zeiss 35mm f/2 Planar lens. © Copyright 2011, 2012 Jeffrey R. Charles. All Rights Reserved. When I first got into Micro 4/3, it was great! On its first use, the Olympus VF-2 EVF allowed me to obtain better manual focus than I'd ever been able to get with any digital camera, with the exception of my old Sony DSC-F707. Even better, Micro 4/3 cameras like this Olympus E-P2 could accept a myriad of lenses via a wide selection of adapters. This held the promise of using my existing SLR film camera lenses and later using sharp and compact rangefinder lenses. And it still gets better. This whole system (not counting the battery charger) fits into the compact and slightly modified Olympus Pen-F case behind the camera, giving the whole system a retro look and feel, just like film cameras I was used to. It was a camera junkie's dream! However, I was already experiencing radial image blur from the camera's AA filter when I used the tiny 28mm f/2.8 Industar-69 lens (lower right) at wider apertures. I just didn't know it yet, thinking the lens was the problem. Better images would result from higher quality short focal length film camera lenses, or so I thought. Left: The Contax G Zeiss 35mm f/2.0 Planar is not even the best of the Contax G Carl Zeiss lenses, but its performance relative to SLR lenses blew me away when tested visually under high magnification. Right: Moon, one day after last quarter, imaged with the Contax G Zeiss 35mm f/2 lens when about 3mm off-axis. 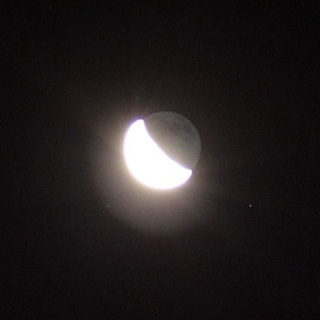 Performance is excellent, with blooming around the moon being dim enough that it does not obscure "earthshine" on the part of the moon that isn't directly sunlit. Earthshine is over 2,000 times dimmer than the sunlit part of the moon, so a short focal length lens has to be good to capture it this clearly. Exposure is 2 seconds at f/2.2 (iris just barely defining the aperture to minimize low angle reflections) with an Olympus E-P2 camera, ISO set to 100. Since the moon is the central third of the image, no blur problem here! 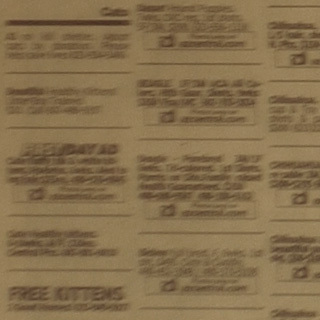 Left: In this newspaper test, a 100 percent crop from a 12MP image shows that central resolution of the 35mm f/2 Contax G Zeiss lens isn't bad even wide open. Right: However, edge performance wide open is less than inspiring with my Olympus E-P2 camera, and edge performance does not get very good unless the lens is stopped down well past f/4. The lens edge performance wasn't this bad, and the Micro 4/3 format only uses half of the lens coverage. Something other than the lens was causing the problem, but I didn't realize this for sure until I had invested in yet another good (and expensive) wide angle rangefinder lens. Another unpleasant surprise was that available Contax G to Micro 4/3 adapters were still cheesy, and the one I acquired had a focus ring of such a large diameter that the camera could not be used on a tripod with it until I filed down part of the focus ring. I later found out about a Contax G lens adapter called the "Monza" adapter that might be better, but was not able to find one for sale. Through observation and testing, it was determined that off-axis performance of a fast f/ratio wide angle to moderate focal length non-retrofocus rangefinder lens is increasingly degraded on certain Micro 4/3 digital cameras when the marginal rays intercept the image sensor cover glass at progressively larger angles from perpendicular to the focal plane. Therefore, a longer distance from the lens exit pupil to the focal plane usually results in better off-axis performance. When the optical distance from the lens exit pupil to the camera focal plane is at least 60mm, an f/ratio faster than f/2 can often be used to advantage. However, at shorter exit pupil to focal plane distances, performance at fast f/ratios gets increasingly worse. The off-axis image is degraded to a far greater degree than what can be explained by lens aberrations alone. The predominant image flaw is off-axis radial blur extending inward from a highlight toward the center of the image. The blur is not a "dim" artifact that only involves a small percentage of the light, but is instead something that has a strong influence on off-axis image quality, even when highlights or strongly backlit subjects are not involved. Another attribute is that on the E-P1 and E-P2, the radial blur begins to appear somewhat suddenly, at a zone on the focal plane where the marginal (e.g. from outer parts of the lens aperture) ray angles exceed between about 14 and 19 degrees from perpendicular to the image sensor. At larger angles, the blur width and intensity increases, with blur width sometimes increasing more than intensity. Performance improves when the angle of marginal rays is decreased, as can be accomplished by stopping down the lens aperture or increasing the focal length. However, one does not acquire a fast f/ratio lens of a given focal length for the purpose of only using it stopped down. In spite of the blur problems, using rangefinder lenses (solid feeling lenses with metal barrels) on my E-P2 has been an enjoyable experience. There are even neat and inexpensive ways to keep accessories such as lens hoods down to a reasonable size. Since only part of the rangefinder lens field of view is used for the relatively small Micro 4/3 format, it does not matter if a hood vignettes parts of the field outside the area utilized for Micro 4/3. Therefore, a short step down filter adapter ring has worked well as a compact lens hoods that I can always leave on the lens. These only increase the length of the lens by about 4mm, and do not increase the diameter at all. I use 46-37mm step down rings as lens hoods on the VC 28mm and the Contax G Zeiss 35mm, and a 43-37mm step down ring is used on the VC 40mm f/1.4. In all cases except using the 40mm at full aperture, I can use a 37mm circular polarizer in front of the adapter without vignetting the Micro 4/3 image. This type of hood tends to obscure the lens bezel and front element, making a lens look less impressive, but appearance isn't the primary function of a rangefinder lens. A compact lens hood that can be left on the lens at all times is handy, but it isn't a new concept. Compact hoods have been around for some time, with a contemporary one being for the Voigtlander 40mm f/2 SL lens. For a number if reasons, I began to suspect that the primary cause of the radial blur was the camera's Anti Alias (AA) filter, referred to by some as an optical low pass filter. However, this did not occur to me until I'd invested in three wide angle rangefinder lenses and experienced radial blur with all of them on my Olympus E-P2. I recently the matter more in 2012 and found that others had come to similar conclusions about AA filters . Some camera manufacturers may have realized this as well , since a few newer digital cameras, including some from Fuji, Nikon, Leica, and Ricoh, offer either a weak AA filter, or no AA filter at all. An anti-alias (AA) filter is intended to blur or locally parse the image slightly in order to prevent moire patterns. Moire results when the regularly spaced camera pixel grid and repetitive features in photo subjects (such as the weave of cloth in a portrait, or shutters and deck railings on distant houses in a landscape) reinforce each other at certain intervals. When such reinforcement occurs, anything from a stairstep pattern to bands and arcs of color can result. It's essentially the optical equivalent of hearing two musical notes beat against each other. An AA filter was important when digital cameras had lower resolution sensors (roughly 5 MP or less) and lenses sharp enough that the pixels limited resolution. This is because a lower resolution sensor could not quite resolve fine repetitive detail in many subjects, and some of these details were imaged at about the same pitch as the pixels. A similar interval in both the pixels and repetitive subject matter results in moire. If a filter is introduced that blurs the image up to a couple of pixels, contrast in moire patterns is reduced to where they are hard to detect, and thus are not distracting. If implemented properly, an AA filter has only slight adverse effect on image resolution when light rays are nearly perpendicular to the AA filter surface. However, an AA filter can seriously degrade resolution if the light rays are a significant angle from perpendicular to the filter surface. As image sensor resolution increased and lenses began to be the limiting factor in resolution, moire became less of a problem, but camera manufacturers continued to use AA filters. One reason for this is that video (particularly HD video) was beginning to become a standard digital camera feature, and the utilized pixel count for each video frame was back down to well below 5 MP again. Unfortunately, some manufacturers increased the effect of the AA filter to work for movies to such an extent that optimum still image performance was lost. It is in this arena of stronger AA filters that cameras began to perform most poorly when used with wide angle rangefinder lenses. Off-axis performance issues that occur when good short focal length rangefinder lenses are used on certain digital cameras are an anomaly of the utilized digital cameras, and has little to do with the quality of the lens. Instead, the angle that at least the marginal rays intercept the sensor cover glass (and AA filter) determine the size of the useful field (e.g. area of acceptable in-focus sharpness) in the image sensor format. This was first observed when using a Contax G Zeiss (CZ) 35mm f/2.0 Planar lens on an Olympus E-P2 Micro 4/3 camera. The Contax Zeiss 35mm f/2 Planar is a good though not perfect lens, as demonstrated by its Modulation Transfer Function (MTF) plots , testing, and even more so by images taken with a camera presumably having a weaker AA filter, such as a Sony NEX-3. Therefore, it gradually became my impression that the AA filters in my Olympus E-P1 and E-P2 cameras were causing the blur problem with images from this lens. This lens has to be stopped down past f/4 before the E-P2 camera will provide an image with acceptable edge sharpness. By "acceptable", I'm referring to an image that looks sharp on a 1080p (1920x1080) display, including in the corners. This is equivalent to 2 or 3 pixels of blur in a 12MP image. However, since edge sharpness isn't critical for many types of photos (portraits, for example) the lens is still useful on the E-P2 for a variety of applications. Before I began to suspect the camera AA filter, I tried other moderately short focal length rangefinder lenses on the Olympus E-P1 and E-P2 cameras and experienced similar poor off-axis results. Other lenses were tried instead of other digital camera systems since I was already somewhat heavily invested in Micro 4/3, partly because the Olympus EVF attachment eyepiece tips up to comfortably view astronomical objects when they are near zenith in astrophotography, or to photograph objects from near ground level. 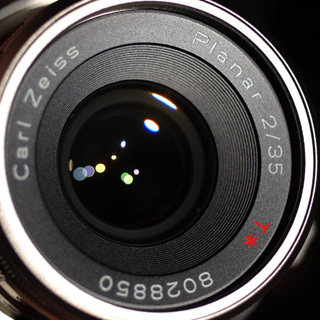 Zeiss specifications for the 35mm f/2 CZ Planar  indicate that the exit pupil is 27.7mm in front of last lens Vertex (which is 22.6mm from the focal plane), for 50.3mm from the focal plane, with an apparent diameter of 24.9mm. The secondary principal plane (rear nodal point) is 12.5mm in front of last lens vertex, for 35.1mm from the focal plane, which corresponds to the focal length. The location of the exit pupil (as referred to in Zeiss data sheets, when specified; or to the degree it can be measured easily by swinging a lens about an axis in which the iris does not appear to translate when viewed from the rear) is what is used in my table below, though it's possible that referencing the secondary principal plane may be more appropriate. I later bought a Voigtlander (VC) 28mm f/2.0 Ultron lens because the cheesy Contax G lens adapter was too noisy for movies using the on-camera microphone. I also wanted a slightly wider angle yet still retain as shallow a depth of field as practical. I also wanted to see if I'd get better edge resolution. However, if I'd suspected the AA filter at the time, I'd have known not to get an even wider non-retrofocus lens. Off-axis images were even worse with the E-P2 when using the VC 28mm f/2 Ultron lens, even though the lens itself tests fine. Images with this lens exhibited even more radial blur at a given f/ratio, but the lens itself does not have aberrations significant enough to even begin to explain this degree of blur. This lens has to be stopped down past f/4.8 before edges of the image even become acceptable on the E-P2. Used wide open or at f/2.4, the radial blur exceeds 13 pixels at the edge of the image. The corners are even worse. This means that the edges and corners of of the 12 MP digital image actually have less edge and corner resolution than an ordinary SD video frame. Kind of poor. The 28mm f/2 Ultron lens also just happens to have the largest rear cell diameter and longest rear cell protrusion distance that can be tolerated with a Micro 4/3 camera. Specifically, the VC 28mm f/2 lens has a 29.51 mm diameter rear cell that protrudes 13.26 mm behind its Leica M lens mount plane. If the rear cell was not anodized and painted (e.g. electrically insulated from the camera contacts) it would probably be slightly larger than what would be safe to mount on a Micro 4/3 camera. The Olympus E-P2 appears to tolerate the Voigtlander VC 40mm f/1.4 Nokton Classic lens (MC version) better than any of the other short focal length, fast f/ratio rangefinder lenses tested to date. This lens will provide a sharp image over most of the frame at f/3.3, even though the marginal ray angle is over 17 degrees from perpendicular to the focal plane near the edge of the frame. It also works adequately at f/1.7 for HD movies. One lens that hasn't yet been tested on my E-P2 is the Zeiss 35mm f/2.0 Biogon ZM , mostly due to the cost of obtaining one. It would almost be cheaper to change camera systems. On the other hand, if the camera did not exhibit objectionable radial blur with this lens, it could replace all of my lenses of similar focal length. However, due to cost and unknown performance with an AA filter, I'll have to let Boigons be Biogons, at least for now. A Nikon retrofocus 35mm f/2 SLR lens does not exhibit the off-axis blurring problem on an Olympus E-P2. However, this lens is not as compact as the rangefinder lenses when the adapter length and diameter are considered. It also has not provided as much contrast and color saturation as any of the above rangefinder lenses, including control of flare. It is desirable to keep the physical size and weight of a camera system reasonable, partly for medical reasons. This is part of why I acquired a few rangefinder lenses even though I already had Nikon SLR lenses of similar focal lengths and f/ratios. I also wanted to stay with something that fits Leica M because I've gradually lost the ability to accurately focus an SLR camera  unless I take a lot of time doing it, so I'm in transition to mostly Leica M compatible lenses for 35mm film photography, also using the lenses on M4/3 digital cameras. Affording a good Leica M camera that won't need goggles for a wide angle (such as an M4-P or M6 0.72x with 28mm frame lines) is another story. As of 2012, was using an all mechanical Minolta CL (not the electronic CLE) film camera, and partly guessing at 28mm framing. The first version of this web page indicated that a digital Leica camera was not in the cards for me due to its high price. However, the cost of a used or demo Leica M9 has since dropped dramatically. My conclusions indicated the Leica M9 was the best solution from a purely technical standpoint due to its full frame sensor and lack of an AA filter, so I started saving up for one. I eventually acquired one with the full 2-year warranty from an authorized Leica dealer. For technical reasons stated later (and the obvious difference in cost), I went with an M9 rather than the newer Leica ME or the Digital M, which was formerly referred to as the M Type 240. The M9 was also desirable because it had the handy frame line preview lever that newer Leica digital models lacked. These examples of off-axis radial image blur were taken with an Olympus E-P2 camera, through a Voigtlander (VC) 28mm f/2.0 Ultron lens, with the aperture set at f/2.0 and f/2.4. © Copyright 2012 Jeffrey R. Charles. All Rights Reserved. The radial blur extends from highlights toward the center of the Micro 4/3 image, regardless of the lens used. This crop from the lower right quadrant of a night image shows the blur extending toward the upper left from highlights on the back of the car at lower right. The blur reduces resolution on everything toward the sides and corners of the image, and is even more obvious on backlit objects. Closer to the image center (upper left of this crop) the weather vane and other distant objects are imaged sharply. This picture shows the entire width of the image from which the next two examples of radial blur will be cropped. 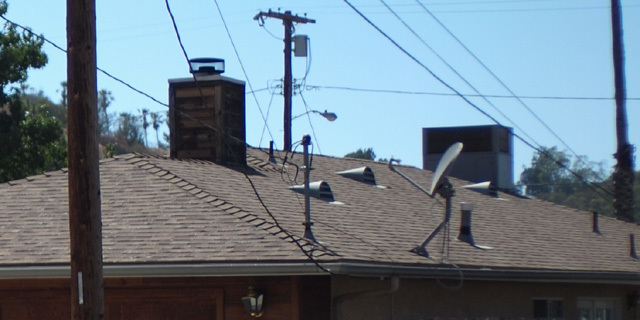 The points of interest will be the right sides of the palm tree and the roof air conditioner at the extreme right of the picture, the wires from the power pole transformer left of that, and the green tree near center. The camera is an Olympus E-P2 and the lens is a Voigtlander (VC) 28mm f/2.0 Ultron. This image is cropped from the right side of the above scene. Here, the lens is focused near infinity, between the distance of the green tree at the left and the palm tree at the extreme right. 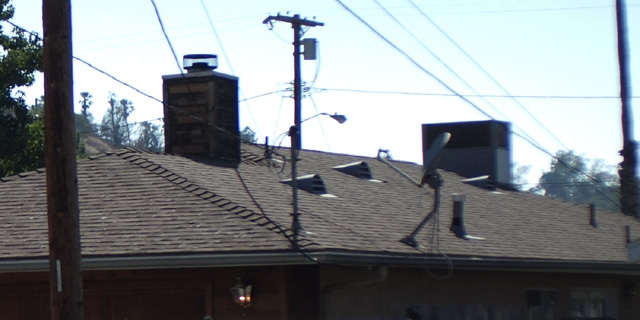 Blur in the original 12MP image is more than 13 pixels wide on the right side of the palm tree trunk, and almost as wide on the right side of the roof air conditioner. The blur is even wider at the corners. However, the blur width decreases toward the center of the original picture, where it is absent on the green tree at left. Note that the palm tree at right is in focus, but light from the background sky is blurred toward the center of the image, and thus over the palm tree trunk. The scale of this image is under 50 percent of the original, so flaws are large enough to be obvious without pixel peeping. Most blue in the backlit wires is from the sky being blurred over them rather than from lens aberrations. Exposure at ISO 100 is 1/4000 sec at f/2.4. In this image, the lens is focused slightly in front of the palm tree, with best focus on the foreground telephone pole. Setting the focus closer reduces the width of the blur at the palm tree trunk distance by almost half, at the expense of some de-focus on the green tree at left (which is near the center of the original picture) and objects beyond it. The exposure at ISO 100 is 1/4000 sec at f/2.0. In spite of the wider f/2 aperture, the focus change reduced the off-axis blur to less than that of the image taken at f/2.4. Backlighting was less intense for this image, but blur width is relatively independent of backlight intensity. Radial blur and color blur is prominent on the side of dark features facing away from the image center. In highlights, blur extends inward from the highlight toward the image center. This is usually independent of the lens used, and becomes obvious once a certain angle (we'll call it a critical angle) is exceeded by a certain percentage of the light bundle. Where the blur is in proximity to a sharply defined backlit subject boundary, it is apparent that the blur ends abruptly, appearing to end as a slightly de-focused double image of the image feature boundary. The blur extending inward from a highlight is the opposite direction from what would be explained by reflections within a cover glass or IR cut filter. With the Olympus E-P1 and E-P2, radial blur appears somewhat suddenly, at zones on the focal plane where the marginal ray angles exceed between about 14 and 19 degrees from perpendicular to the image sensor, depending on the lens. Blur width increases with increased ray angle from parallel to the optical axis. With a 28mm f/2 non-retrofocus lens, used at f/2, the blur at the extreme edge exceeds 13 pixels (more than 55 microns), or roughly 1/315 of the picture width. This is many times the extent of lateral chromatic aberration (LCA) in any of the lenses used or tested, and is about as bad as VCD video resolution. Where the blur has color that is not prominent in the subject matter (purple or blue in a direction inward from a highlight), color saturation in the blur is at times decreased for wider blur widths. It is presumed that this is because the wider blur is convolved with a comparatively lesser degree of LCA. Focusing a lens slightly in front of the subject (focusing the VC 28mm f/2 lens at 20m for a subject at infinity) can radically reduce radial blur and blue or violet color blur in distant subjects, while causing only moderate blur of the central subject. However, this probably does not apply to all wide angle rangefinder lenses. The Olympus 17mm f/2.8 "pancake" lens appears to have only a ~23mm exit pupil to focal plane distance, yet when used at f/4, its radial blur is less than half as wide as the blur when the VC 28mm f/2 Ultron is used at the same aperture. However, the presence of even this much blur in Olympus 17mm pancake lens images may be why Olympus has not provided a firmware update that corrects it in the camera. This type of blur would be difficult to correct because the blur occurs in all color channels, so it is not the same as mere LCA. Since this lens seems to work adequately when marginal ray angles exceed 21 degrees, it is a moderate exception to the marginal ray angle versus blur severity that applies to rangefinder lenses on Micro 4/3. The Leica M8 and M9 do not have AA filters. The M9 has Moire, almost like the old Canon G2 camera had, but it has little radial blur - and it's a full frame sensor. The Hasselblad V96C digital back has no AA filer, and also has no blur inward from a highlight. Any blur is very dim and goes outward, clearly being from its sensor cover glass. The SHARP Contax G Zeiss 35mm f/2 lens samples sent to me in 2011 (to evaluate the lens) were taken with a Sony NEX-3, which may have had a weaker AA filter than the NEX-5 and NEX-7, or my Olympus E-P2. An AA filter would explain the unusual feature of the blur being closer to center than the highlight that is blurred. Reflection generally can't explain this, but certain refraction properties can. An AA filter would also explain why the blur gets narrower as the f/ratio is slowed. Slowing the f/ratio also reduces the angle of the steepest marginal rays near the image edge, as well as the range of ray angles at the image edge. An AA filter would explain why the image is blurred within each color (channel) of the image. Each channel of the image is blurred, rather than it merely being an offset or difference in image size between channels. Where there is a difference in size, it is simple color fringing (usually from LCA) that is a fraction as wide as the blur. The few sample pictures I've seen from the Voigtlander 17.5mm f/0.95 and 25mm f/0.95 lenses (which are designed for Micro 4/3)  are not very sharp toward the edge even at moderate f/ratios. Sample from the 17.5mm images never seem to get really sharp outside of a roughly 11mm to 14mm diameter circle, though I haven't seen test shots with either lens at really slow f/ratios (e.g. f/11). There really isn't anything to contradict the AA filter being the cause, though other elements in the cover glass "stack" could have contributions. To date, I have not located much detailed discussion about the radial blur problem on Micro 4/3 cameras. Some who mention such blur simply note that it exists. AA filter issues in Micro 4/3 cameras have often been discussed only in the context of some Micro 4/3 cameras taking sharper pictures than others when using the Olympus or Panasonic digital lenses, as opposed to 35mm rangefinder camera lenses. This is part of why this document exists, so people can further expolore the matter of using rangefinder lenses with such cameras. It is not likely that I'll be able to engage in the discussion beyond writing this (I probably won't even be able to answer E-mail from individuals on the subject) but hopefully it will fuel constructive discussion, and perhaps the M4/3 manufacturers will even start to make cameras that adequately accommodate wide angle rangefinder lenses. There would be some benefit to this for compact Micro 4/3 or other compact digital cameras, since customers who use compact Micro 4/3 digital cameras and also still shoot film may be more likely to have compact film camera systems such as rangefinders. The same lenses used for rangefinder film photography could then be used effectively on their Micro 4/3 cameras. This probably would not have a large impact on Micro 4/3 zoom lens sales, since the zoom lenses are still desirable and convenient when there is adequate light for them, or when shallow depth of field is not needed. 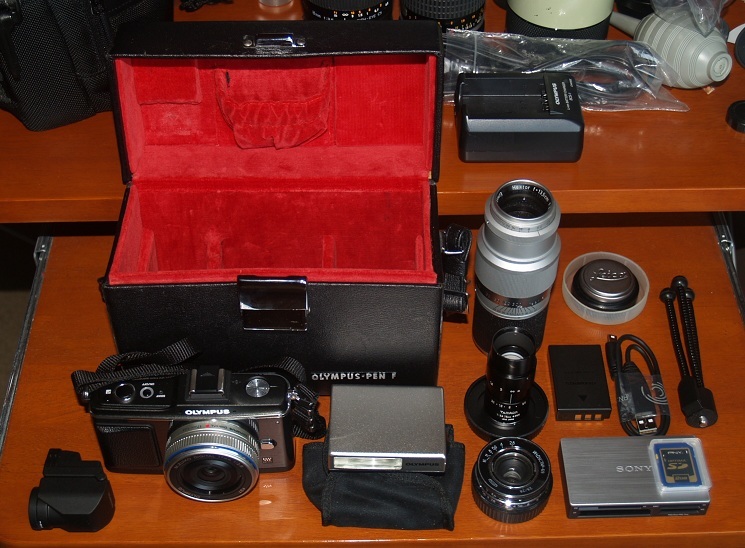 The rangefinder lens discussion I have seen to date has emphasized Sony NEX cameras. This could be because the Sony NEX is a higher end, higher priced camera with a larger sensor than M4/3, and people who can afford it may also be more likely to also have rangefinder camera lenses to use on it. There is a distinct advantage in the larger sensor size (all other things being equal) since it will have larger pixels, for more pixel sensitivity and less need for noise reduction at low ISO settings. One person even removed the AA filter from his Sony NEX-7 and did some tests. The results seemed to show a little improvement, but were not conclusive. However, it appears that he may have accidentally used a 45mm Contax-Zeiss lens at a relatively slow f/ratio (f/4), rather than the 28mm he intended to use, so it may not have been a short enough focal length lens to reach an obvious critical ray angle. Some refer to removing the AA filter from a digital camera as sensor "hot rodding" that's done to get the most resolution possible and make a good image better. Images above show that an AA filter can contribute to, or even result in, downright bad pictures when using some rangefinder lenses on an E-P2 camera. Therefore, if the AA filter in an E-P2 is removed or replaced with a far weaker one, it would not be a change from good toward excellent as the term hot rodding may imply. Instead, the purpose would simply be to go from inadequate to adequate performance when using rangefinder lenses. Some have mentioned a company that removes AA filters from certain cameras. However, the company is not named here because it was non-responsive to an inquiry about removing the AA filter from my E-P2 camera. If the AA filter is the sole culprit in my Olympus E-P2, a "Critical Angle" may be more subjective, since blur would increase with ray angle, though probably not in as graceful a way as being linear. References I have found do not mention a critical angle, but here, I define it as the marginal ray angle that corresponds to the image field radius where blur or fringing from the AA filter clearly exceeds that which could be caused by lens aberrations. The radial blur problem with my current digital cameras has obviously led to a search for cameras that are less likely to be plagued by the same problem. This usually indicates a camera with no AA filter or a very weak AA filter. Unfortunately, low cost is not to date an attribute of such cameras. Of the rangefinder lenses discussed above, the Contax G Zeiss 35mm f/2 Planar focuses closest, focusing down to 0.5m. However, the none of the focusing adapters for Contax G lenses are quiet enough to take movies with an Olympus E-P2 when using the on-camera stereo microphone. Most of the other lenses noted above are Leica M39 mount or Leica M mount and focus quietly, but most of these only focus down to 0.7m at best, partly because 0.7m is the closest focus distance supported by the Leica M rangefinder. It would be desirable to modify some Leica M Mount and other wide angle rangefinder lenses to focus down to 0.5m. However, since the forward longitudinal motion of the rangefinder cam exceeds the forward motion of the optics when a wide angle lens is focused close, rear parts of the lens barrel assembly in these lenses would require an additional ~2mm of clearance from the rangefinder cam if rangefinder coupling is to still be retained after the close focus distance of the lens has been modified. This clearance is required to accommodate additional relative motion of the rangefinder cam with respect to the lens optics when the lens is focused closer. The rangefinder cam moves in accordance with the longitudinal position of a ~51mm focal length lens at different focus distances. Such close focus modifications would obviously be with the recognition that a Leica rangefinder camera won't track the rangefinder cam to closer than 0.7m, but this would not be a problem because the closer focus distance would only be utilized for digital imaging. Scale focusing could be used for the closer distance in film photography. The lens helical focus threads would also require an additional 40 percent of margin to remain engaged at a 0.5m close focus distance. Most lens threads have considerably more margin than this, though the rangefinder cam threads may not have as much margin. Contax G lenses between 21mm and 45mm focus to 0.5m, which can get one used to having the feature. A Leica M digital camera would be desirable, but as of the time I wrote the first version of this page, high cost and shutter wind motor noise were issues with these. Second generation and later Leica digital rangefinder cameras have a discrete mode, where the shutter wind motor can be set to a slower and queter speed, though this still is not as quiet as a manual shutter wind lever. The older Epson R-D1  (which is manually wound and thus lacks objectionable motor noise) could be the ticket, particularly if a new version was offered with a 12 MP APS sensor or a 16~27 MP (but not more than 27 MP in order to maintain adequate native dynamic range) full frame sensor, frame lines for up to 90mm or even 135mm lenses, live view with a tilting EVF (integral or as an attachment), low ISO settings for low noise without excessive NR processing, and menu settings that survived powering the camera off and on. The Fuji X-Pro1 and Ricoh GXR camera with its A12 Leica M-Mount Module may pick up where the Epson left off. Leica has already done this in a number of ways, but lagged behind Fuji and Ricoh on introducing an EVF. The Ricoh is also quiet, lacks an AA filter, and offers a tilting EVF attachment, though the current EVF is a lower resolution one. However, its images do not appear to have as much shadow detail as images from the Leicas. Appendix A covers some advances made to date and more possibilities for the future. A VC 28mm f/2 Ultron is used for close range movies (focus is quiet) and low flare stills. VC 28mm f/2.0 Ultron: Moderate focus shift, field curvature, and CA limit maximum useful f/ratio to f/3.3 for a good image, and f/4.8 for a sharp full frame image. CZ 35mm f/2.0 CG Planar: Spherical aberration limits maximum useful f/ratio to 2.8 for a good image; f/4.5 for a really sharp full frame image. No infinity stop. Zeiss 35mm f/2.0 Biogon ZM: Has not been acquired or tested. It's MTF looks good, but an AA filter (bad glass behind good glass) can undo that. VC 40mm f/1.4 Nokton: Spherical and CA limit max useful f/ratio to ~f/2.8 for a good image, and f/3.4 for a really sharp full frame image. This is better than the other tested lenses, but the 40mm has more veiling flare and its focal length is a little longer than I'd prefer on Micro 4/3. The above f/ratios are somewhat pessimistic compared to actual imaging of many real world subjects because the maximum f/ratios indicated are what will theoretically provide an image that is almost limited by a Micro 4/3 camera's pixel size (in the absence of an AA filter), which is quite a good image. In reality, all of the above lenses will capture acceptable images (even good images) when stopped down only half a stop below maximum aperture, if there was no AA filter blurring. This is particularly true for HD movies. However, When the same lenses are used on an Olympus E-P1 or E-P2 Micro 4/3 camera for 12MP still images, the maximum useful f/ratios are often reduced by more than an additional f-stop slower than what is shown in Table 1 below, due to off-axis radial image blur. The VC 40mm f/1.4 Nokton would be adequate (other than for the AA filter issue) if it was a 30~35mm focal length. Most compositions with the 40mm on the Micro 4/3 format are a little tight, which is why a 35mm or slightly shorter focal length is preferred. The VC 35mm f/1.4 has not been seriously considered as an option because it is reputed (and shown in test images on the web)  to have more focus shift and CA than the 28mm f/2, and its short physical length and slightly protruding rear element probably mean that its exit pupil is relatively close to the focal plane, which would increase the marginal ray angle at the image edge. I still use the 40mm Nokton more than the other medium wide RF lenses because it performs better than the 28mm at fast f/ratios on my E-P2, and its focus is quiet enough for movies. The 40mm also has very little focus shift at f/ratios slower than about f/2.4. However, a better lens (in the absence of AA filter issues) may be something like a 35mm f/2 Contax G Zeiss Planar that has a Leica M mount and a smooth and quiet focusing mechanism that retains the 0.5m close focus distance. I've seen some conversions, but they look a little rough for what they cost. The 35mm f/2 Contax G lens has positive attributes that even many modern Leica and Zeiss lenses lack. One is a short physical length. Another is its 7 blade iris that has a slight curvature to the blades. Compared to the 10 long and bright diffraction spikes (sun stars) around bright highlights in images from many VC, Leica, and newer Zeiss lenses with irises having 10 straight iris blades, the 14 weaker and slightly fanned diffraction spikes from the 35mm f/2 Contax G Zeiss lens are less distracting. The relatively small front element probably reduces flare, and would likely do so even more if modern multi-coatings were used. The Zeiss 35mm f/2.0 Biogon ZM  could replace all 3 of the above lenses on my digital cameras if the AA filter is not as much of an issue with it. It's MTF  is even better than the Contax G Zeiss 35mm f/2 lens, but the marginal ray angle will probably have a greater influence on the off-axis image with my Micro 4/3 cameras than the MTF of the lens itself. The positions of its secondary principal plane and exit pupil are not known (not on its data sheets like for older Zeiss lenses), so it would be difficult to evaluate without direct testing. Also, these optical attributes do not always define performance on a camera having an AA filter. Tests Illustrating Limitations of Selected Lenses when Used on an Olympus E-P2. The table below shows f-stop versus maximum useful field diameter in millimeters when the three tested rangefinder lenses are used on Olympus E-P1 or E-P2 micro 4/3 digital cameras. The table also shows the angle at which the extreme marginal rays intercept the camera Anti-Aliasing (AA) filter at the outer boundary of the useful field. In reality (since the blur artifacts are not very dim), more than the extreme marginal rays would be involved, but the marginal ray angles at least provide a basis for comparison. The AA filter is suspected of being the component that severely reduces off-axis performance, since the image begins to radially blur outside of the noted field diameters. To date, this has applied regardless of the inherent performance of the wide angle fast f/ratio rangefinder lens used. The field diameter is defined here as the area beyond which radial blurring becomes more significant than the lens aberrations to an obvious degree. This is admittedly a little subjective, but it still helps quantify the problem by illustrating that the size of the field having acceptable resolution can be very small in relation to the image sensor unless the lens is stopped down considerably. In the worst case for blur width (full aperture with a 28mm f/2 lens), radial blur near the edge of the image sensor exceeds 13 pixels, making the edge resolution of my 12MP digital camera image worse than that of an ordinary SD video frame. The following table shows the useful field diameter versus focal length and f/ratio when the tested lenses are used on an Olympus E-P1 or E-P2 camera. The values were obtained through tests in which different subjects were imaged. When possible, the same subjects were imaged under the same conditions with each lens. Subjects include daytime landscape scenes, an array of newspapers, and astronomical objects. The Olympus 17mm f/2.8 M. Zuiko Digital pancake lens is included for reference. * Dimensions in millimeters. Aperture radius accounts for any clipping* by barrel. * Distances from exit pupil to focal plane are estimates unless data available. pupil diameter, since the lens appears to be of a slightly retrofocus design. * Data arranged per the following columns. Notes at right may indicate test subjects. Typ. max. marginal ray angle without obvious radial blur with this lens: 20.2 deg. Typ. max. marginal ray angle without obvious radial blur with this lens: 15.0 deg. Typ. max. marginal ray angle without obvious radial blur with this lens: 16.0 deg. 35mm f/2.0 Biogon ZM / Not acquired or tested. Typ. max. marginal ray angle without obvious radial blur with this lens: 17.9 deg. * Minimum calculated critical ray angle (accounts for aperture clipping) is 14.5 deg. ** However, if no highlights that make blur obvious are imaged, minimum is 15.7 deg. * Maximum calculated critical ray angle (based on FL/f-stop) is 18.8 deg (40mm lens). * The aperture is clipped by lens barrel on Micro 4/3 format only if indicated by *. to lens aberrations, and lens aberrations are usually larger at wide apertures. in the marginal ray angles that determined useful field sizes. effective optical distance from the lens iris (exit pupil) to the focal plane. Based on microscopic visual examination of axial and off-axis performance of the lenses in the absence of digital camera anti-alias (AA) filter, it has been shown that the lenses do not have aberrations even remotely severe enough to cause the blur that limits the field size to values noted above. However, when these lenses are used on an Olympus E-P1 or E-P2 camera, the AA filter (assumed to be the problem, based on the above) generally prevents good off-axis results unless the lenses are stopped down to between f/4.8 and f/8, which are even slower f/ratios than some Micro 4/3 kit zoom lenses. Therefore, a camera with either no AA filter, or with a very weak AA filter, would better accommodate wide angle, fast f/ratio non-retrofocus rangefinder lenses. Micro 4/3 manufacturers need to wake up and smell the coffee or they could get left in the dust by other manufacturers that appropriately address the AA filter issue. Two accessory shoes (or at least a PC socket) so flash can be used with the EVF. An in-camera stereo microphone for movies. HD movie frame rate of 30 FPS. Since none of the newer Leica digital rangefinder models offered the above features (and because the new models even dropped the frame line preview lever), the M9 made sense. An M9-P was preferred (has more durable LCD cover and does not have a loud red dot on the front), but its cost was considerably more. A Leica M9 is still expensive, but if the entire system cost is compared to either high end digital SLRs or Micro 4/3, the cost difference is not as extreme. The cost comparison is particularly true when comparing image quality versus cost of better Voigtlander VC lenses to higher cost Micro 4/3 prime lenses. When this comparison is made, and when image quality of the full frame sensor in a Leica M9 is compared to Micro 4/3, the M9 makes more sense. A Micro 4/3 camera body is still useful for movies, especially if fast f/ratio Leica M lenses from an M9 system are used for such movies. I hope you enjoyed this little foray into the effects of Anti Alias (AA) filters. The appendix that follows focuses on what I (and perhaps many others) wish digital camera manufacturers would offer. Some are getting close, except for the price. Jeff C.
This appendix reviews some of the above, covers some of my own experieces with digital cameras, makes observations some current digital rangefinder cameras, and explores the possibilities of where things could go. To start with the basics, a simple symmetrical and spherical fast f/ratio lens element will usually be sharpest when imaging objects close up, and the image will degrade as subject distance increases. To get good images of distant subjects, the lens figure needs to have less symmetry (to put it simply) so it can refract nearly parallel incoming rays into a small point at focus. A lens that does this is said to be corrected for spherical aberration. A single element must be aspheric to achieve this, so multiple spherical elements are used in most camera lenses because it usually costs less than fewer aspheric elements. If a lens or lens system is somewhere between the above symmetrical lens and a lens that sharply images a distant subject, it is said to be "under-corrected" for spherical aberration, and it will often perform better at a close focus distance than on a distant subject. If a lens instead departs from the symmetrical lens to a greater degree than what is required to provide a good image of a distant subject, it is said to be "over-corrected". An actual camera lens has more elements than the simple examples here because a camera lens has to bring multiple colors acceptably close to the same focus, and also provide a sharp images over the whole format. A rangefinder camera lens can be perfect for film when optimized for having only air between it and the focal plane, so this is how film camera lenses are designed. Also, since film camera lenses were usually considered "good enough" if they resolved 40 to 60 lines per millimeter, and excellent if they resolved more than 60 lines/mm, lens designers had the freedom to sacrifice some central performance or even sharpness over the entire frame to achieve other results. 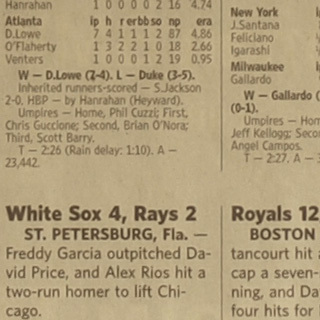 One of these "other results" is good "bokeh", where an out of focus background is smooth and pleasing. Nikon has sought to implement this in some of their lenses for decades, but it's obvious that it wasn't attempted in lower cost vintage SLR lenses such as a Soligor 90-230mm zoom I used to use. Spherical aberration correction and bokeh are inter-related because spherical aberration changes the characteristics of an out of focus blur on either side of focus. Without using floating elements, both can only be fully optimized for one focus distance, though results are usually acceptable over a range of distances. For example, in a lens that is under corrected for spherical aberration, light rays from outer zones of the lens come to focus closer to the lens than rays from the center. This causes rays from outer zones of the lens (where most of the light is collected) to increasingly "cross over" each other through a small range of distances slightly inside focus (e.g. closer to the lens than best focus). Farther inside focus, rays from outer zones of the lens become relatively concentrated in a bright ring at the outer boundary of the blur circle. Meanwhile, outside focus, rays from inner zones of the lens are concentrated toward the center of the blur, and rays from outer zones of the lens (being farther from their points of best focus) are fanned out over a relatively large area, usually softening the blur circle boundary. Therefore, an under corrected lens will usually have harsh (e.g. poor) poor foreground bokeh and soft (neutral to good) background bokeh. This is because de-focused objects in the foreground are inside of focus where the bokeh is harsh, and background objects are outside of focus, where the blur circle has a softer edge. A slightly under corrected lens may also perform relatively well at close focus distances, where a little under correction (rather than correction optimized only for distant subjects) can actually be desirable. Spherical aberration also causes focus shift because when the lens aperture is wide open, rays from outer zones of the lens make up the majority of the light reaching the focal plane, and these come to focus closer to the lens than light from the center zones of the lens. As the lens is stopped down, rays from the outer zones are eliminated, and all that's left are rays from the central zones of the lens, which are not at best focus. Therefore, when an under corrected lens is stopped down, it has to be set at a slightly closer focus setting (moving the lens farther from the focal plane) for rays from the un-obscured inner zones to be in best focus. If a lens has perfect spherical aberration correction, the out of focus blur will look the same both inside and outside of focus, resulting in neutral bokeh where the blur is evenly illuminated, but may have a hard edge. This is most often seen in aspheric fast f/ratio lenses. Some fast f/ratio lenses using all spherical elements are a mixed bag, because spherical aberration and bokeh can only be optimized for one focus distance and one or two aperture settings. Therefore, such lenses may be slightly over corrected when the aperture is wide open, and properly corrected or slightly under corrected at small apertures. Lenses like this often have harsh background bokeh wide open, where the outside boundary of the blur circle is a ring that's brighter than the rest. When the lens is stopped down 0.5 to 1.5 stops, bokeh usually becomes neutral, then even soft when the lens is stopped down more. This type of bokeh is seen in many medium to high end all-spherical lenses, including the Contax G Zeiss 35mm f/2 Planar and the VC 40mm f/1.4 Nokton. Optimum bokeh at maximum aperture and spherical aberration correction that provides optimum "in focus" performance at both infinity and at moderate to close focus distances usually can't co-exist in a fast f/ratio lens (especially if it does not use an aspheric surface or a floating element), so lens designers often have to choose between optimum resolution at moderate to long distances and good background bokeh. The Contax G Zeiss 35mm f/2 lens appears to be in the category of emphasizing sharpness, because while it has good in focus performance, it also appears to have what some consider to be the worst type of background bokeh, where a round de-focused blur is brighter at its boundary. This causes de-focused linear objects in the background appear almost as double lines. However, bokeh improves when the lens is stopped down a little. Occasionally, a lens that does not have optimum spherical aberration correction for close focus distances will have moderate to good background bokeh at full aperture. An example of this is the original 1960's version of the 105mm f/2.5 Nikkor lens. Under high magnification, a slight loss of in-focus resolution can be observed on subjects as distant as 2 meters because the lens is not fully corrected for close distances. However, this same slight loss of close focus resolution, combined with good bokeh, also made the 105mm f/2.5 Nikkor an outstanding head and shoulders portrait lens. The resolution loss at 2 meters is very slight, and can only be detected on very fine grain film. Also, when the lens is stopped down a couple of f-stops, it performs adequately even for macro photography with bellows. An example of slight spherical under-correction for the range of focus is the Voigtlander VC 28mm f/2 Ultron. At f/2.4 and slower, this results in slightly better background bokeh at the expense of slightly softer wide aperture images of distant subjects. Due to slight under correction, this lens works relatively well at close focus distances. These observations about bokeh, etc., are not hard and fast rules, but they do fit reality in many cases. For many decades, good results at fast f/ratios could be taken for granted in film phtography. Normal lenses of f/1.8 or faster were commonplace, and an f/1.4 lens was financially within reach of many 35mm camera owners. Normal lenses from f/1.2 to slightly faster than f/1 were also available, but were more expensive and thus less common. Moderate wide angle and telephoto lenses were usually f/2.8, but f/2.0 and even f/1.4 was available in focal lengths from 35mm to 85mm. Between the focal lengths of 20mm to 28mm and 100mm to 180mm, f/2.8 was not uncommon. Likewise, fast f/ratio lenses (f/1.2 to f/1.8) were common in analog video camcorders. With the advent of consumer digital cameras, sensor resolution reached 1.3 Mega Pixels (MP) relatively fast, but early cameras were not always supplied with fast f/ratio lenses. As cameras approached 2 or 3 MP, several models began to have zoom lenses with an f/ratio of f/2 at the wide angle end. Some of these zooms were adapted from video cameras made by the same manufacturers, so the results were not always sharp. When cameras of 5MP or more became widely available, maximum f/ratios began to get slower, but there were exceptions including the Canon G series, some Olympus cameras, the Sony DSC-F707 and others. During this period, maximum f/ratios of most digital cameras began to drop to f/2.8 or even slower. In the realm of digital SLR's (DLSRs), there was heavy emphasis on zoom lenses over prime lenses, and the zooms were often a slow f/3.5 to f/4 at wide angle and f/5.6 at telephoto. For me, digital photography wasn't worth the investment until the Sony DSC-F707 camera became available in about the year 2000. It was only then that the pictures at digital camera review sites became good enough that I could actually enjoy looking at the picture itself without being distracted by obvious image flaws. The Sony DSC-F707 was also one of the few cameras of the period that offered an f/ratio versus field of view that was comparable to popular film camera lenses. Therefore, I didn't get into digital photography until the Sony DSC-F707 came out. The Sony lacked interchangeable lenses, but its lens was adequate for many subjects, and a video wide angle attachment provided barely acceptable wide angle images. I also developed afocal lens systems to use it with a longer focal length lens or on a telescope. The tilting lens of the DSC-F707 made it possible to use its EVF viewfinder even when the camera was pointed straight up at the zenith. For years, DSLRs were expensive and seemed to lag behind technically. When DSLR prices became more reasonable, I figured that I'd get a mid range Nikon with an APS sensor because all of my film camera lenses were for Nikon. However, I was surprised and disappointed to learn that only higher end Nikon DSLRs provided metering with Nikon AI lenses. This single oversight ruled out Nikon DSLRs for me, since metering with my Nikon lenses (used via adapters) was possible on certain other DSLRs, including Canon. Unfortunately, the "pixel wars" began before I got a DSLR. As the pixel count went up, pixel size (and with it native pixel sensitivity) went down. Soon, sample pictures on review web sites began to show loss of real detail in favor of overly aggressive noise reduction to compensate for the small pixels. Highlight clipping also started getting worse. Canon seemed to hold the line on pixel count longer than most other manufacturers, so their budget cameras up to the 10 MP XSi model (Rebel 450D) still seemed to provide realistic results. After that, noise reduction too excessive for my taste appeared even in their DSLRs. Therefore, I passed on DSLRs until years later, when the price of some used DSLRs fell below that of even some film cameras. After the price drop in second hand DSLRs, I got a used Olympus E-500 and 2 zoom lenses for $300. Meanwhile, 35mm form factor DSLRs continued to have more noise reduction and digital pictures from them began to look less realistic than film images, at least to me. DSLR lens f/ratios were still slow, yet the lens prices were going up, so I decided not to invest in a DSLRs beyond the low cost used E-500 I already had. Instead, for taking "good" pictures, I decided to incrementally build up a used Hasselblad V film camera system with a few lenses and an older model digital back that uses an external hard drive. This combination actually cost less than a new full frame DSLR with equivalent lenses, and took better pictures. Some results were even comparable to my previous medium format film pictures. Even better, maximum f/ratios of Hasselblad V lenses were faster than those of many 35mm form factor digital camera zoom lenses, and the Hasselblad equipment has a solid feel that enhances the photographic experience. The only drawback other than size was a low ISO setting, but I'd always used low ISO film and a tripod in my better film photography anyway. It was at about this time that I began losing the ability to accurately focus a DSLR, so I started looking for alternatives to take everyday photos. The 10-year old Sony DSC-F707 lacked interchangeable lenses, but it was still adequate for pictures its zoom range. Since I could still focus its EVF accurately, I was still using the 707. However, it had a flaw where electrical connections at the pivot for the tilting lens gave out. I was on my third DSC-F707 camera because the first one developed the pivot connection problem and the second developed an intermittent white balance problem. If the Sony DSC-F707 had worked reliably long term and had modern day HD movie capability and more memory card capacity, its simple interface and tilting rear section with EVF would make it an adequate and well handing camera even today. In fact, the industry had to re-learn some of the benefits of this camera (including a quiet motorized zoom, etc. ), when cameras that take HD movies became popular. Therefore, I decided not to get into any new digital cameras until a camera was available with a tilting EVF like the DSC-F707, and that was also compatible with fast f/ratio lenses. After some research, I found that some people were using fast f/ratio film camera lenses on a relatively new type of digital camera called Micro 4/3. One fast f/ratio Micro 4/3 lens was even available (20mm f/1.7 by Panasonic) and the Olympus 17mm pancake lens was f/2.8, which wasn't too unreasonable. Best of all, the second generation Olympus E-P series cameras were compatible with an accessory EVF that could be tipped up. At last, it looked like something was available that could replace my aging Sony DSC-F707, and since an E-P camera also has interchangeable lens capability, one of them could also replace my E-500 DSLR. In 2011, I got into a used Micro 4/3 system, taking the hit on dynamic range in favor of a physically small camera with a tilting accessory EVF that worked for my photo applications. Micro 4/3 digital zoom lenses were still of slow f/ratio and very few fast f/ratio prime lenses were available, so I eventually acquired a couple of fast f/ratio rangefinder film camera lenses. However, it was then that the AA filter related radial blur problems in this article were encountered in a big way. It wasn't until around early 2012 that M4/3 digital camera manufacturers started offering a reasonable selection of fast f/ratio digital lenses. Olympus now makes a 12mm f/2, 45mm f/1.8, and 75mm f/1.8 lenses for Micro 4/3 (to name a few), and Leica makes a 25mm f/1.4, but some of these cost more than VC and Zeiss rangefiner lenses, and lack the benefit of being compatible with film cameras or larger format digital cameras. It is also possible that AA filter issues hinder performance of the 12mm f/2 and 25mm f/1.4 lenses, based on impressions of test images I've seen. The AA filter also seems to be an issue for the VC 17.5mm f/0.95 and 25mm f/0.95 lenses. The flaws at f/2.8 look more like AA filter or tilt related blur than flaws in the lens optics, though I haven't tested any of the f/0.95 lenses in person. Nikon and other DLSR manufacturers are now making fast f/ratio prime lenses from at least 35mm to 85mm focal length, but many of these are expensive, physically large, and flimsy feeling compared to Nikon AI manual focus film camera lenses. After some testing, I found out that the Voigtlander VC 40mm f/1.4 Nokton can work adequately at fast f/ratios for 720P movies with my Olympus E-P2 as long as I keep the subject centered. So, at least the ability to use f/1.4 is back in the picture for limited applications. The VC 40mm f/1.4 lens performs incrementally better at f/1.7 and f/2, so I stop it down a when practical. The bokeh (out of focus background blur) is also better at f/2, and even f/2 beats the f/3.5 of the kit zoom lens! However, radial blur from the AA filter is still an issue for many applications when using fast f/ratio rangefinder lenses on an E-P2, which brings us to issues with using rangefinder film camera lenses on digital cameras. When a cover glass for a digital sensor (and especially an AA filter) is introduced between a normal to wide angle non-retrofocus fast f/ratio film camera lens and the focal plane, numerous changes in the performance and "personality" of a lens can be observed. This may include changes in bokeh, and introduction of spherical aberration, focus shift, off-axis color fringing, off-axis blurring, field curvature, and other artifacts that are not inherent flaws of the lens. In the worst case, an overly aggressive AA filter may blur the entire image from a fast f/ratio lens, including at the very center. The effects of an AA filter are usually most severe when light from near the margins (e.g. edges) of a lens intercepts the filter at a significant angle from perpendicular. These angles are usually largest on wide angle rangefinder lenses because the aperture of such lenses is in mechanical proximity to the focal plane. At the other extreme, the ability to keep light rays relatively perpendicular to the sensor was a selling point in some of the early regular 4/3 format digital SLR cameras and related lenses. However, the same consideration was partly lost on some of the subsequent Micro 4/3 digital camera lenses. A lens can be optimized to compensate for the thickness of a sensor cover glass by slight changes in correction for spherical aberration, astigmatism, and chromatic aberration, but such optimization cannot fully overcome the effects of an AA (blur) filter. When a digital camera used with wide angle rangefinder lenses, it is also necessary to compensate for color shift toward the edge of the frame, since an IR cut filter will act differently at different angles. This becomes more pronounced with a large sensor and rangefinder lenses that have minimal back focus and a steep angle between the rear element and the sensor edges. The Leica M9 had to overcome many hurdles to address all this. One of its lens profile functions specifically to compensates for this. New Leica M lenses are said to be optimized for digital, but since the Leica M8 and M9 work with every Leica lens dating back to 1950, some of the optimization also had to be in the camera. In addition, the new Leica lenses are supposed to still perform adequately on film, also indicating that digital optimization is split between the camera and lens. Digital compatibility is a multi-faceted situation, ranging from optical performance in general, to color balance across the format, to metering and auto exposure, to incorporating lens information in EXIF data, and much more. Each facet requires its own viable solution. In the area of optical performance, digital imaging presents many challenges that are not encountered in film photography. Many of these challenges relate to the image sensor and the filters and protective glass that may be in front of it. Each layer of optical material and each type of filter coating can potentially cause ghost images or even blurring, so it is important to limit the surfaces and coatings to what is needed, rather than blindly following every convention in the industry. Leica had to consider this when they came out with their first digital rangefinder camera, the M8. In addition to avoiding the obvious AA filter problem, they also thought it was worth trying something new for the Infrared (IR) cut filter, since such filters can cause unwanted and distracting reflections and blooming around highlights, plus a gradual increase in a green cast toward the edge of the picture. Therefore, the IR cut filter was under-implemented in the M8 to such an extent that some black objects (synthetic fabrics, for example) look purple in the picture unless an IR cut filter is used IN FRONT of the lens. Requiring photographers to use an IR cut filter in front of each lens may at first seem ridiculous, but it actually makes perfect sense in light of the challenges that are unique to implementing an IR cut filter in a rangefinder camera. Rangefinder lenses usually are not of a retro-focus design like SLR lenses. This means that the rear element of a wide angle rangefinder lens could be within 10~20mm of the focal plane, resulting in a large range of angles at which light rays from the lens intercept the image sensor and any IR cut filter in front of it. This angle can exceed the radial field of view of the lens. If the IR cut filter is in front of the camera lens, it only has to accommodate a range of incident angles slightly more than the radial field of view for the lens, since rays entering the lens from any given point in the subject are almost parallel. However, an IR cut filter behind the lens has to accommodate incident ray angles equal to the SUM of the radial angle of view for the lens, PLUS the radial convergence angle of the light bundle from the lens. For a fast f/1.4 normal lens, this can almost double the acceptance angle required of the filter. Another reason that a front filter is not entirely unreasonable is that most Leica digital rangefinder owners probably would not own a large number of lenses, so filter cost would not be excessive. The main drawback of a front filter is the potential for ghost images. The advantage is less risk of double imaging or blurring by reflection within the weaker IR cut filter in the camera. Apparently, enough Leica users complained about a front IR cut filter that when Leica introduced the full frame M9, the weak rear IR cut filter was dropped in favor of a more conventional one. This increased the green gradient toward the edge of the picture, but Leica implemented lens profiles that subtracted out this often substantial gradient. However, some Leica M9 sample pictures that were taken under overcast conditions with 50mm and shorter lenses seem to have a few pixels of blurring in fine backlit detail (such as distant tree limbs) toward edges of the frame, with even more blurring at the corners. It is similar to the radial blur in an E-P2, except it is much narrower and fainter. It even appears to consist of the same apparent double imaging of the feature boundary. Puzzling too is that the blur is closer to the center of the picture than the bright side of the imaged feature. This is the same direction as the Micro 4/3 radial blur, and is the opposite direction one would expect for blur from reflection in a simple IR cut filter. This is only seen in rare M9 image samples. I haven't seen even a trace of this artifact in images from the Leica M8 and the audibly quieter M8.2, so it's possible (though not certain) that the blur artifacts are from the stronger IR cut filter in the M9. If this is the case, Leica got it right the first time, with the weak IR filter in the M8. The blur artifact also does not appear in any samples I've seen from the Epson R-D1 or the Fuji X-Pro1 when either are used with fast f/ratio lenses. If all future full frame Leica models have the same edge blur flaw as the M9 (even though it's visible only under some light conditions), it could lead me to prefer an M8.2 over full frame models in spite of the 1.33x crop factor of the M8.2. I'm not currently inclined toward either due to the price, but at least the M8.2 seems to lack the image artifacts, and it appears the M8.2 addressed some of the motor noise issues of the M8. To solve compatibility problems for using old rangefinder lenses on new Leica digital rangefinder cameras, Leica came up with some absolutely brilliant solutions. When one considers the volume of brain cells needed to conceive solutions for the many challenges encountered in developing a digital rangefinder camera, and the fact that Leica usually won't do something until they can do it right, it helps explain why it took Leica so long to come out with a digital rangefinder. A Leica M9 is not in my budget, but it's still nice to know that there are still a few manufacturers out there that will go the distance necessary to develop something like the M9. In their digital compatibility design, Leica decided NOT to have ANY electronic communication between the camera and the lens. For now, this limits exposure modes to full manual or aperture priority auto exposure, but these functions work even with 60 year old lenses. The identification of older lenses is done by retrofitting a 6 bit optical bar code to the older lens mounts. The camera reads the bar code as the lens is twisted onto the mount, and thus knows what lens is used. It can then implement built in correction for the IR cut filter, distortion and chromatic aberration, etc. The beauty of this is that it is easy to implement on older lenses. No IC's required. Leica even came up with a way to include the aperture setting in the EXIF data, even though there is no electrical connection to the lens. The M9 main light meter is a through the lens (TTL) type that resides inside the camera and reads light reflected off the metal focal plane shutter blades, with the meter indicator being an LED array similar to that in the Fujica ST-801 or the Nikon FM. Now, here's the brilliant part. The Leica M9 also has a small non-TTL light meter sensor on the front of the camera. By comparing the reading from the non-TTL meter cell and the TTL reading that is reflected from the shutter blades, the camera estimates the aperture setting to within half a stop or so. All pretty cool. Merging the old with digital photography in a way that can retrofit to the old with a few dabs of paint on the lens mount! The above focuses on the Leica M9 because it shows that when a manufacturer really wants to solve a technical problem, or even a large set of problems, they usually can if they try hard enough. Unlike many manufacturers that have marketed 3 or even 4 generations of cameras with the same obvious problems such as excessively strong AA filters, Leica has made course corrections with each generation. This does not mean that the Leica M9 is perfect, but it does show that Leica has come a very long way in just 3 generations of an interchangeable lens digital rangefinder camera. At the time I wrote the first version of this web page, I had no plans to get a Leica M9 the foreseeable future since a whole used Hasselblad system with a Circa 2005 digital back costs less than a new Leica M9 body alone, and the Hasselblad back has more dynamic range. This situation changed somewhat when Leica M9 prices began to drop, particularly for used or demo models, and then even for new ones with the Leica warranty. Another factor was that Hasselblad digital backs for the V system have sensors that are almost 15 percent narrower than the film format in 16 exposure (645 format) film backs, often resulting in less than optimum digital fields of view, plus having to adjust to differeces in coverage with a the same lens on film versus digital. If Hasselblad/Imacon had made a digital back with a 53x40mm or larger sensor for the V system, I may have never considered anything else. The Leica M9 has motor noise when it winds its shutter, which is about my only technical complaint about the M9 beyond somewhat limited dynamic range in comparison to the Hasselblad. The M9 would have been a lot better in my view if there was an option to disable the shutter wind motor and use a good old-fashioned wind lever, as on Leica M film cameras and the Epson R-D1 digital rangefinder. Then the camera would be quiet enough for almost any application. This is just a matter of preference rather than technical merit, since others may vastly prefer the convenience of motorized shutter winding. The Leica M9 lacks live view, movie modes, and a high resolution EVF attachment. This does not matter for seasoned rangefinder users (probably the target audience), but having used both rangefinders and high resolution EVF's myself, I have found that, at least for me, an EVF (especially with magnified focus assist) results in better focus in less time. On the other side of the coin, I can currently get better focus versus time with a rangefinder than I can with an SLR. Live view and an EVF would also make it possible to use the M9 (or subsequent Leica digital rangefinders) with long focal length lenses or even telescopes. Further, the value of using a single camera for both stills and video can't be over stated, since the video camera you have with you is the only one that gets used. However, movie mode, being lower resolution, could be compromised without an AA filter, unless something such as constantly changing binned pixel combinations was used for video. An EVF lacks one advantage of a rangefinder though, and that's the ability to observe the subject at the very second the image is captured. When I was a professional photographer some time ago, I found that a rangefinder or twin lens reflex (TLR) camera was invaluable for portraiture, since I could instantly tell if a subject blinked during the exposure. There is also a diminishing return with an EVF if it can't be used in all situations. For example, the EVF and a flash both compete for the same accessory shoe, making it impractical to use the EVF and flash at the same time. This was discovered on Micro 4/3, so I gradually started prototyping a PC socket on one side of the Micro 4/3 EVF attachment to solve the problem. The Leica M9 (with its dropping price) makes sense because of its lack of an EVF as the main finder. Its rangefinder is always used to focus and frame, so there is no competition for the flash shoe. The Leica M, Type 240 (now the Digital M). Almost There, But Not Quite. The Leica M9 material above was first written while available information was limited to the Leica M9 and earlier models. Since then, Leica introduced two more full frame cameras. The Leica M Type 220 (later named the ME) retains the 18MP sensor but loses the handy viewfinder frame line preview lever. The Leica M Type 240 (later named the Leica M) increases the sensor resolution to 24MP and adds live view, an optional Visoflex EVF2 accessory EVF, and both SD and HD movie capability. It lacks an illumination window for the frame lines, instead using an internal light source to illumimnate the frame lines. Internal frame line illumination could obviously evolve into electronically generated frame lines, which in turn would make it practical to introduce lenses in additional focal lengths. Here, my own preference would be a 65mm f/2 lens that has excellent MTF and relatively even frame illumimination at f/2.8 and slower. When I used zoom lenses for 35mm film photography, I often used a 65mm setting, and focal lengths I often used on other formats (100mm Planar on the Hasselblad and 210mm on 4x5) were also equivalent to a 65mm lens on a 24x36mm format. It at first seemed like the Leica M Type 240 (now the Leica M) embodied all of the features I wanted to see in a digital M camera. However, a brief look at the details revealed that it had not. Unfortunately, the Leica digital M has some of the same shortcomings that plagued early Micro 4/3 cameras. Most notable is that there is only a single hot shoe, but FOUR accessories that compete for it: A flash unit, the EVF, auxiliary finders for wide lenses, and a stereo microphone. These are the same shortcomings that delayed my getting into Micro 4/3 cameras, yet years later, the same shortcomings are being repeated in this generation of the Leica M.
The first shortcoming common to early Micro 4/3 cameras (and even some current ones) is that the EVF cannot be used at the same time as a flash unit. Both compete for the accessory shoe, and there wasn't even a small built-in flash until the E-P3. (The E-P2 doesn't even have a PC synch socket to permit getting around the problem with a flash bracket.) The second shortcoming common to early Micro 4/3 cameras is the lack of an on-camera STEREO microphone, so movies taken with the Leica digital M on-camera microphone only have monaural sound. It seems strange that such apparent oversights still plague even modern high end cameras. These shortcomings still give lower cost Micro 4/3 cameras a foothold when it comes to taking movies. The "shoe shortage" could be corrected by implementing an in-camera stereo microphone, TWO permanent accessory hot shoes, and a PC synch socket. It would be ideal if both shoes have full capability, but it would be adequate if one shoe is dedicated to viewfinders (EVF or wide angle optical), and the other to either a flash or microphone. These dual uses for each accessory shoe probably would not result in competition for the same shoe much of the time. It's time for digital camera makers to stop thinking so much like like film camera makers that they don't even seem to realize that it's OK to have two permanent accessory shoes on a digital camera. Other M shortcomings are that the HD video frame rate is only 24 to 25 FPS, with 30 FPS only being available for SD. However, one good aspect of the video is that it is saved in MJPEG, as my Olympus E-P2. This takes more memory, but has the advantage of making each video frame sharp enough to be a useful 1MP still image. Last but not least in drawbacks is participation in the latest round of "pixel count wars". The higher resolution 24MP sensor of the digital M has smaller pixels, so it's likely to have less native dynamic range. Speaking for myself, I'd rather have an 18MP sensor with more native dynamic range, since this requires less in-camera noise reduction that can extinguish real subject detail. (Too bad the 18 MP Leica ME doesn't have live view and video modes, etc.) This again brings up the comparison to a modest used Hasselblad system with an older digital back (old enough to have a tethered hard drive), which is cheaper used than the Leica digital M body alone, and probably takes better pictures, partly due to higher dynamic range and lack of edge blurring. For me at least, the current Leica Digital M hasn't quite reached the bar for a camera in this price range (which is beyond my means anyway), and it may never reach the bar if the pixel count (and with it, in-camera NR) keeps going up. Close, but still no cigar. Other than the lack of an EVF, full frame sensor, live view, and video capability (admittedly a large set of shortcomings), the older Leica M8.2 appears to have a slight edge over some newer digital Leica models in regard to clean images that lack the dim but distracting double image and blur artifacts, provided IR filters are used in front of the lenses. For still pictures, good image quality is really what it's all about. The M9 is even better, given its full frame sensor. In spite of the perceived drawbacks above (some of which are admittedly a matter of preference rather than technical merit) the difference between the Leica M9 and the Leica digital M represents a huge leap for only one additional generation. At the same time, the digital M not quite reaching the bar has made the M9 a more practical near term choice for my own full frame digital photography. Once upon a time, there was something called film that didn't have double image and blur problems... and film images can still be a good standard for measurng digital progress. Developments made for the Leica M9 and Leica digital M provide some hope for the future. Specifically, since Leica saw fit to make the NRE investment needed to implement such cameras, other camera makers will probably come up with a lower priced full frame camera that (like the M9) isn't as big as the current full frame digital SLRs, doesn't have shutter wind motor noise of the M9, and can accept compact yet sharp lenses. However, for this to succeed (especially if the camera has movie mode), manufacturers will have carefully assess the balance between a weak AA filter, no AA filter, or the expense of a switchable AA filter. For now, the Fuji X-Pro1 seems to be converging on very elegant solutions, with the notable exception of lacking a full frame sensor that would make "medium format like" shallow depth of field easier to accomplish. Digressing to film cameras, one obvious and attractive convergence of camera technology should within reach technically, but it is unknown if it can happen from a business standpoint. This would be something similar to a digital version of the Contax G1 or G2, the very film cameras that the Contax G Zeiss lenses were made for. The Contax G1 and G2 are auto focus cameras with only a clear viewfinder (no real rangefinder), with manual focus override that relies on a focus confirm indicator. They are also both manual and auto exposure (with electrical connection to the camera) and have relatively quiet motorized film advance / shutter winding, plus a zoom viewfinder that sets itself for the lens that's attached. Most of the ingredients needed to make a similar digital camera system (including 6 existing Carl Zeiss lenses ranging from 16mm to 90mm) exist, so integration of the digital sensor and related aspects would still remain. Not trivial, but the Contax G concept is there and may be better than starting from scratch. Better yet, convergence of the Contax G concept, a Leica M9, and EVF compatibility (even a switchable EVF like Fuji offers) could result in some very major advances. The difference between the Contax G and most older rangefinder film cameras is that the auto-focus and electrical communication with the lens is the direction things usually have to go in order to enable "affordable" digital cameras that have the simplicity of operation most people will tolerate. This in turn would provide the economy of scale manufacturers need before it is feasible to offer a lower cost product. Contax wasn't a low priced camera (that's obvious from using Zeiss lenses) and they went out of the camera business some time ago, so the related tooling and know how may not be around any more. However, the concept is still there to build on. While in the realm of wishful thinking, an neat option for APS and Micro 4/3 cameras would be a new manual focus version of the sharp Contax G Carl Zeiss 45mm f/2 Planar lens, but scaled down to a 30~32mm focal length (a nearly ideal focal length for some subjects on Micro 4/3) and with 7, 9, or 11 slightly curved iris blades. Auto focus would be OK, as long as it could be turned off and a smooth, direct (rather than fly by wire) manual focus capability is retained. However, this lens would not cover a full frame 36mm x 24mm format if scaled down, and the market for it could be more limited. Therefore, since Leica M-mount film cameras are full frame and because Leica now makes a full frame digital rangefinder, it makes more sense for a new manual focus lens (even a 30~32mm) to cover a full frame sensor, which would call for a different design than a scaled down 45mm Planar. The 30~32mm focal length mentioned for Micro 4/3 would correspond to 55~65mm on a full frame sensor, depending on whether scaling is based on the long or short side of the frame. Another neat development would be if full frame digital cameras had slightly larger sensors that are also of 4:3 aspect ratio. Such a sensor could be 36x27mm ("Super 35" format, if you will) and would still work with many 35mm full frame lenses, at the expense of more darkening at the extreme corners with some due to a 45.0mm versus 43.3mm diagonal. This would provide more freedom in the aspect ratio of the final image without as much cropping. A comparatively economical way to effectively get a 4:3 sensor area of 36.9 x 27.7mm is to use 35mm camera lenses on early Hasselblad digital backs (V96, etc.) that have square sensors, then just crop the image. However, this requires an expensive adapter with a shutter. Commercial systems that use Nikon SLR lenses on Hasselblad backs have long been avalable, but I'm not aware of any for Leica M lenses. The latter could be more compact, but would not benefit from the extra coverage provided by some Nikon Perspective Control (PC) lenses. Back to current digital cameras, the continued trend of Olympus toward keeping the light bundle as perpendicular to the sensor as practical (as in 4/3 lenses) is evidenced by many of the collabsible Micro 4/3 lenses. These lenses could be even more compact than they are now at the expense of the rear elements being close to the focal plane, but this would result in steeper ray angles to corners of the frame. Micro 4/3 lenses usually avoid this. The only widely distributed exception to the rule may be the Olympus 17mm f/2.8 pancake lens, which performs poorly by comparison with the other Micro 4/3 lenses, with off-axis color fringing and blurring being the most notable flaws. If radial blur from the AA filter is part of the problem when the 17mm lens is used on an E-P1 or E-P2 (can't comment on the E-P3), it could explain why Olympus did not come out with an in-camera correction for it, since radial blur within each color channel would be a far more complex problem to address than lateral CA alone. An obvious example of deliberately trying to keep the light bundle angles controlled is the 9-18mm f/5~5.6 zoom for Micro 4/3. This lens is collapsible, so the rear element is close to (about 18mm from) the focal plane when it is stowed. However, when the lens is deployed, the elements all move forward. Instead of keeping the rear element within the 12-15mm of the focal plane that is mechanically possible, it moves out to at least 25mm, with the iris plane even farther from the focal plane. Unfortunately, it it possible that the 9-18mm lens may not telescope out enough at all focal lengths, since it has to be stopped down to between f/6.3 and f/8 (depending on the focal length) for the image to be reasonably sharp at the edges, let alone the corners. It's good that its image at least becomes OK at these f/ratios, because diffraction starts visibly degrading the image at much smaller f/ratios. An interesting side show is that when the lens is collapsed, it has enough back focus to fit a rangefinder film camera, yet still provides an almost acceptable wide angle image. Most lenses made for 4/3 and Micro 4/3 cameras work pretty well on their respective digital formats, but the results may not be as good as "what people are used to" on film. In general this does not matter, since many current digital camera owners have never used a film camera. In a sense, they don't know what they're missing so they don't miss it. To be acceptable on Micro 4/3 when the camera is set to a 12MP image size, a lens needs to exceed 100 lines/mm resolution. This probably explains the slow f/ratios of the 4/3 kit zoom lenses, and why the 9-18mm does not work all that well until stopped down to f/6.3. Bokeh is seldom an issue with such short focal lengths combined with slow f/ratios, so manufacturers can concentrate on resolution and flare reduction. However, fast f/ratios where bokeh comes into play even at moderate focal lengths (28~40mm) is something that cannot be optimally achieved with compact rangefinder lenses on many current Micro 4/3 cameras, due to the AA filter. The need for really high resolution with Micro 4/3 is why it's amazing that any film camera lenses of normal to long focal length work as good or better on Micro 4/3 lenses than many of the lenses that are made for 4/3 and Micro 4/3 digital cameras. A good normal to tele lens for a 35mm film camera lens may in some cases have less of a problem with a digital camera AA filter than some digital camera lenses. This is why some old tele lenses such as the Tamron 400mm Nestar work really well. The Samyang 8mm f/3.5 SLR lens also works relatively well on 4/3 and Micro 4/3, since it is a retrofocus design made for SLRs, which minimizes the range of ray angles. It is only when trying to get a fast f/ratio (mainly to achieve shallow depth of field) with a 40mm (80mm equivalent) or shorter non-retrofocus lens, or a fast f/ratio (f/0.95~1.6) lens that the Micro 4/3 AA filter issue becomes severe. But it is a problem for these applications, which are important to some. Shallow depth of field is easy to achieve with a full frame (36mm x 24mm) sensor or a Hasselblad (etc.) medium format digital back, but it isn't so easy on smaller formats such as Micro 4/3. To get the depth of field of a 70mm f/4 lens, a a shorter focal length and faster 35mm f/2 lens is needed, and so on. In general, it's harder to get really good performance at f/2 than it is at f/4. Getting good performance with a 35mm f/2 lens is further hindered by an overly aggressive AA filter. Weakening or removing AA filters would benefit many Micro 4/3 camera users. In general, Micro 4/3 has done a good job in holding the line at 12MP in order to better control noise, rather than joining in the pixel wars that are meaningless in the absence of lenses with enough resolution to match the higher sensor resolution. One thing that is missing is an ISO 50 (or lower) setting that would reduce noise below that in current low setting of ISO 100, without losing detail through as much noise reduction processing. Combined with being able to tone down or completely turn off in camera sharpening, this could result in really clean landscape pictures, for example. Another consideration for Micro 4/3 is accessories and cases. While less significant than the cameras and lenses, these items can contribute to the look and feel of a camera system. Here, it would be neat if Olympus would re-introduce the Pen-F hard shell gadget bag case for digital, but make it about 12mm wider and 18mm taller to accommodate 3 of their zoom lenses. The added width would permit the right compartment to be wide enough for Micro 4/3 lenses without making the center compartment too narrow for the flash. The added height would permit the 40-150mm zoom to be stored vertically, with another lens above or below it. A case of this slightly larger size would accommodate the camera, EVF, 9-18mm zoom, the 14-42mm kit zoom (and maybe the 12-50mm zoom instead), the 40-150mm zoom, plus a small flash, extra batteries, a card reader and memory cards. If the case was a little deeper or a trim version of the battery charger was available, even the battery charger could fit. With the Epson R-D1 having paved the way, the Leica M8, M8.2, M9, and digital M refining the way, and the Fuji X-Pro1, Leica digital M, and the Ricoh GXR camera with A12 Leica M-Mount Module incorporating or being compatible with EVFs (with the latter leaving out the AA filter) things are getting better and better. If Micro 4/3 manufacturers eliminate or moderate the AA filter, while also reversing the trend toward more in-camera noise reduction and over-sharpening, I may be able to stay in the plush lined Micro 4/3 rut I'm presently in. Otherwise, I may find myself behind other, more rangefinder-lens-friendly, digital cameras. The rest of the industry is on the move, offering more cameras with either weak AA filters or no AA filters. Jeff C.
Update: Many months after writing the above, and after dashed hopes that the newer Olympus E-PL5 Micro 4/3 camera would lack an AA filter (which it doesn't), I gave up on Micro 4/3 as a long term solution and ultimately ended up going with a Leica M9. The following Appendix B links to some early results from a Leica M9, which takes far better pictures than Micro 4/3. Micro 4/3 will still be used for movies and snap shots, but the Leica will be used when I want to get "good" pictures. Lens Coding. It works great! Appendix A: Leica M9 Apparently Fails to Achieve Infinity Focus with any of 8 Lenses Tried. The above leica M9 links above were formerly to an appendix of this web page, but as the review matured, it became long enough to be a separate web page at this site. Therefore, the links now are to the separate review web page. Critical Ray Angle, Range for Olympus E-P2 Minimum: 14.5 to 18.8 deg. Leica M Mount: 	Bayonet to FP	27.80 	Adapter ~8mm long, so M43 <19.8. samples observed to date. However, a little (~0.05mm) variation has been detected. Carl Zeiss, Planar (R) T* 2/35 Contax (R) G mount lens data sheet, 2000. Carl Zeiss, Biogon T* 2/35 ZM (Leica M mount) lens data sheet, date TBD. dpreview forums, Re: AA filter on NEX-7, but none on NEX-5N?, 2012. Rockwell, Ken; Review of Zeiss 35mm f/2.0 Biogon T* ZM lens. Reference (TBD) for focus shift in VC 35mm f/1.4 lens. Reference (TBD) or link for sample photos from VC 17.5 and 15mm f/0.95 lenses. Reference (TBD) or link for person who removed the AA filter from a Sony NEX-7. All aspects of the material herein (with exception of referenced Contax G Zeiss 35mm f/2 lens specifications) Copyright 2012, 2013 Jeffrey R. Charles, All Rights Reserved. Originated: 120829. Published at Versacorp.com: 120717. Rev. : 120922, 120924, 120928, 121002, 130126.